As a Bush administration political appointee Assistant Attorney General in the Office of Legal Counsel of the Department of Justice, Jay Bybee, a Mormon, wrote one of four torture memos released last month. Bybee's August 1, 2002, 20-page memorandum laid out in excruciating detail the interrogation techniques he was authorizing the Central Intelligence Agency (CIA) to use on al-Qaeda operative Abu Zubaydah. Bybee authorized ten "enhanced interrogation techniques" to encourage Abu Zubaydah to disclose "crucial information regarding terrorist networks in the United States or in Saudi Arabia and information regarding plans to conduct attacks within the United States or against US interests overseas." The torture techniques authorized were (1) attention grasp, (2) walling, (3) facial hold, (4) facial slap, (5) cramped confinement, (6) wall standing, (7) stress position, (8) sleep deprivation, (9) insects placed in a confinement box and (10) waterboarding. The current Attorney General of the United States Eric Holder has stated that waterboarding is torture, while the previous Attorney General Judge Mukasey refused to comment on whether waterboarding is torture. From recently released CIA documents, we know the CIA waterboarded Abu Zubaydah 83 times and Khalid Sheikh Mohammed 183 times. But, we know that from March through June, 2002, according to FBI interrogator Ali Soufan in an op-ed to The New York Times on April 23, 2009, FBI interrogators had already gotten "actionable intelligence" from Zubaydah using traditional, nontorturing interrogation techniques, including that Khalid Sheikh Mohammed was the mastermind of 9/11 and that Jose Padilla was planning to be a "dirty bomber." Ninety of the 92 interrogation videotapes the CIA admits it destroyed were interrogations of Abu Zubaydah. Zubaydah's British attorney Brent Mickum, in the most detailed account the public has had of Zubaydah's life, states that after all the waterboarding and other torture methods used, the CIA finally recognized Zubaydah was not the senior al-Qaeda leader they had portrayed him to be. According to Mickum, the military commissions at Guantanamo are now "airbrushing" his name from the charge sheets of other Guantanamo prisoners. Mickum reveals Zubaydah was severely wounded in Afghanistan in 1992 while fighting communist insurgents after the withdrawal of Soviet forces. He has two pieces of shrapnel in his head, which have affected his memory to the extent that "he cannot remember his mother's name or face." Mickum states that Zubaydah was shot and severely wounded when he was picked up in Pakistan. His life was saved by a John Hopkins surgeon flown to the region. After being saved from death, he was almost tortured to death by CIA operatives. Mickum says that Zubaydah is a stateless Palestinian with no country to argue on his behalf and a United States government now embarrassed at being caught in its own illegal conduct. We know that combinations of the other nine techniques authorized by Jay Bybee can be classified as torture, as the Convening Authority of the Military Commissions at Guantanamo Susan Crawford declared when she dismissed the charges against Guantanamo prisoner Mohammed al-Qahtani, in January, 2009, in the last days of the Bush administration. Crawford said that for 160 days al-Qahtani's only contact was with the interrogators and that 48 of 54 consecutive days he was subjected to 18- to 20-hour interrogations. He was strip searched and had to stand naked in front of a female agent. Al-Qahtani was forced to wear a woman's bra and had a thong placed on his head during the course of his interrogation and was told that his mother and sister were whores. With a leash tied to his chains, he was led around the room "and forced to perform a series of dog tricks." He was threatened with a military working dog named Zeus. The interrogations were so severe that twice al-Qahtani had to be hospitalized at Guantanamo with bradycardia, a condition in which the heart rate falls below 60 beats a minute and which, in extreme cases, can lead to heart failure and death. At one point, al-Qahtani's heart rate dropped to 35 beats per minute, the interrogation records showed. The torture techniques Jay Bybee authorized in 2002 migrated to Iraq in 2003. Maj. Gen. Geoffrey Miller traveled to Iraq from Guantanamo to demonstrate to soldiers in Iraq the techniques the military and CIA were using in Guantanamo. In September 2003, another Mormon, a woman soldier, US Army Spc. Alyssa Peterson, said she refused to use the interrogation techniques that Bybee had authorized on Iraqi prisoners. An Arabic linguist with the US Army's 101st Airborne Division at Tal Afar base, Iraq, 27-year-old Peterson, refused to take part in interrogations in the "cage" where Iraqis were stripped naked in front of female soldiers, mocked and their manhood degraded and burned with cigarettes, among other things. Three days later, on September 15, 2003, Peterson was found dead of a gunshot wound at Tal Afar base. The Army has classified her death as suicide. Jay Bybee, in thanks for his being the loyal soldier to the Bush administration's policies of torture, was nominated and confirmed by the US Senate as a judge on the Ninth Circuit Court of Appeals, where he sits to this day in his lifetime appointment. Jay Bybee, an author of torture, reportedly has a placard in his home for his children that reads, "We don't hurt each other." Alyssa Peterson, for saying no to torture, is dead, perhaps by her own hand. To help Army Spc. Alyssa Peterson rest in peace, I say we should demand accountability from our officials and IMPEACH the torture judge, Jay Bybee. Ann Wright is a 29-year US Army Reserves veteran who retired as a colonel. She was a US diplomat, who served in Nicaragua, Grenada, Somali, Uzbekistan, Kyrgyzstan, Sierra Leone, Micronesia, Mongolia and Afghanistan, where she helped reopen the US Embassy in December 2001. She has traveled to Gaza twice in the past three months and will make her third trip in May 2009. 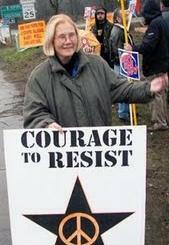 She is the co-author of "Dissent: Voices of Conscience."